Isma Goncalves scored the only goal of the game to give Hearts a much needed victory and leave Dundee deep in Ladbrokes Premiership relegation trouble. The former St Mirren player netted from close range in the 13th minute as Ian Cathro's side ended a run of four straight defeats with a 1-0 win. The hosts had chances to add to their lead but Dundee goalkeeper Scott Bain was in inspired form. The visitors had opportunities of their own, with Tom Hateley hitting the post and substitute Craig Wight missing a gilt-edged opening. The victory keeps Hearts on the coattails of fourth place St Johnstone, while Dundee remain a point above the relegation play-off zone. 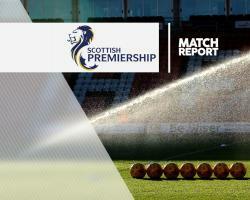 The hosts' confidence had taken a hit after losing six of their last seven matches but Cathro's side made a promising start against relegation threatened Dundee. Five minutes were on the clock when Alexandros Tziolis made first time contact with Don Cowie's deep corner but the Greek's downward volley drifted well wide. But the Hearts fans were on their feet in the 12th minute when Goncavles scored his fifth goal for the club. The Portuguese rounded Dundee goalkeeper Scott Bain after running on to Cowie's pass and he managed to squeeze a low effort into the net, despite Darren O'Dea's desperate attempts to make a block on the line. Bain then made a comfortable save to take in an Arnaud Djoum header before the visitors had a sight of goal at the opposite end. Cammy Kerr's long throw caused panic and just as full-back Hateley was about to pull the trigger at the back post, winger Jamie Walker made a goal-saving intervention. The same two of Cowie and Goncalves combined again and Hearts should have been two up after 22 minutes. Cowie cross but the marksman completely missed the ball with his attempted volley from 12 yards. Dark Blues keeper Bain then made a stunning save to stop his side from going two down. Stand-in left-back Andraz Struna dug out a cross and the unmarked Djoum saw his header kept out by the strong hand of Bain. The woodwork denied Dundee an equaliser two minutes before the break as Jack Hamilton pulled off an equally impressive save. Hateley's free-kick was intended as a cross but the ball skidded off the ground and was heading goalward before the Scotland squad shot-stopper pushed the effort on to the post. Struna and Krystian Nowak both had passes cut out by Craig Wighton and the substitute ran clear of the latter before pulling a woeful effort well wide with just Hamilton to beat. In a game of few chances for Dundee, that was a big miss. Hearts kept probing in the hope of putting some daylight between themselves and their opponents. There was an injury-time chance for Paul McGowan but the Dundee midfielder scooped the ball over the bar from inside the box.